It's a lovely card for an 18th Pat and I am sure Zoe loved it. Sounds like my kind of celebration. Gorgeous card Pat, so grown up and elegant! Wonderful design and colours, the flowers are gorgeous! Absolutely gorgeous Pat, love it! Belated 18th birthday wishes to your granddaughter. 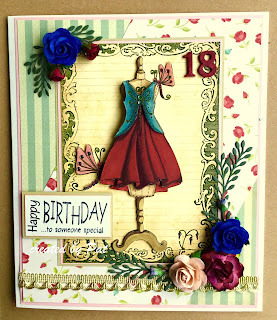 This is fabulous Pat, such a beautiful image and pretty papers - a super card. Wow, Pat, this is such a chic card! I love the gorgeous mannequin! Fabulous card, love the dress.